I left my car on the side of the road this morning after I had gotten a flat in one of my tires. I didn’t have a spare, so I just left it there and I had my wife come take me home. Do I need to be worried about the city towing my car away? You mentioned that you first want to make sure your car is in a safe location like it is, but I don’t want someone else towing it for me. I’d like to get a tow service on my own. I would agree that if you ever need a tow on a freeway it is a good idea to have directions to give the towing service, so that they can find your car right away! That is smart to have a preferred towing service already selected just in case your car were to ever breakdown! Having your car safely parked and out of the way of incoming traffic, I would agree is a good idea! Thank you for sharing! I really like how you suggested that, “First, make sure that you’re vehicle is in a safe location off of the highway, preferably to the right side of the road and out of the median area if you have the choice.” I agree with you because this way you don’t run the chance of getting hit by another car. My car broke down the other day and I realize I didn’t know who to call. Is it cheaper if you are able to tow through your mechanic shop? It’s really important to make sure that you move your vehicle to a safe location off the highway when waiting for a tow truck. I’ll keep this in mind and try to watch for mile markers if I have a breakdown. Staying off your cell phone also seems like a good idea which I wouldn’t have thought of. It’s really important to preserve the battery and be available for calls from the towing company. Thanks for the advice! Thanks for the tips to grab both your cell phone and keys before getting out of your car. This is a really great precaution to take so that you don’t get locked out of your car and so that you don’t lose valuable communication. Overall, in this type of situation, it’s important to make sure you are cautious and mindful about the things you’re doing, so that you don’t make any awful mistakes. Thanks for the reminder and tips! Thanks for the advice about how to react if my car ever breaks down while I am driving. Making sure that my vehicle is off of busy roads is a good first step. I wouldn’t have thought to look for a mile marker, so that is really smart! That way, if I need to call a tow truck, I’ll be able to tell them exactly where I am at. It’s a good thing to have a towing service on-call in case of emergencies. I’ve been surprised with a flat and no tow service so your tips for choosing a service have been really helpful. I wasn’t sure how to use mile markers to know my location so I appreciate the info! I’ve wondered what to do if I were ever in the need of a tow. After reading your article, I know now to pull over to a safe place and figure out where I am. That way I can be safe from other traffic, and I’ll be able to tell the tow truck where I am. I’m trying to teach my kids what to do if their car ever breaks down. I appreciated that your first bit of advice was to make sure that the vehicle is in a safe location. Also, I liked your advice to gather up information about your car if you are going to leave your vehicle. Thanks for sharing this! Great tip about figuring out where you are at before calling a towing service. Knowing the exact location of the vehicle would hopefully help make their job easier and faster. Sometimes I worry my car will break down, so I will be sure to follow these steps in case it does. I’m always worried about what to do if my car breaks down on the road. This guide is great and has helped me to fell more confident that I would be able to handle the situation. thanks for the tip to take information about my car and insurance if I have to leave the car to get help. I’ll definitely remember this information. Thanks! These are some great tips, and I appreciate your advice to make sure your vehicle is in a safe location when waiting for a tow. I’m about to buy my first car, and I want to make sure I’m prepared for anything that may happen while driving it. I’ll keep in mind that safety is important when waiting for a tow, and I’ll be sure to pull off as far as I can when waiting. Thanks for the great post! Great advice because you can never be too safe when your a tow truck driver, even on side roads people sometimes drive like crazy and you have to pay attention still. These guys are great. I had a flat tire off I-75 and they came out in no time to get me, and take me to an auto repair shop. Thanks guys! I’ve always been afraid of getting stranded in the middle of nowhere with my car broken down. I’ll make sure I remember to get my vehicle to a safe location before calling a tow truck! I’ll also make sure I have my keys and cell phone with me at all times, too. Thanks for the helpful tips! Thanks for the post. These are some really helpful tips to keeping safe. I agree that knowing what mile marker you are at can be really helpful for the towing company. The more precise you are with knowing where you are can help you to be located much faster. I thin getting off the road as soon as possible will be a lot safer. Nice post, very handy advice. Point #6 is often overlooked and it can be very frustrating for the two truck company when they’re trying to call you back for more information on your location! In your article, you stated that if you cannot find a mile-marker, please prepare your last known location and look around for some kind of a distinctive landmark such as an overpass or billboard. My brother was on a road trip last night when he called me because his car broke down on the freeway. 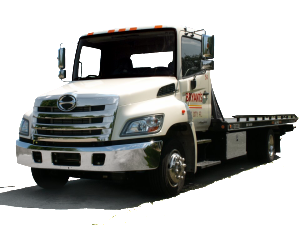 Do most towing services offer other services as well as towing the vehicle to a different location? I agree that you want to make sure that you get the vehicle out of harms way as soon as possible. That not only protects you, but other drivers as well. I haven’t had to have a tow before, thankfully, but if I ever do, I will definitely follow these tips. I want to be prepared for anything! This is great info. Most people just pick up their phone and call without having all the info that the tow truck driver needs. Safety is something that is also widely overlooked when you are stranded on the side of the road. We always tell customers to stay in a safe area next time they need a tow truck. I like that you mentioned finding the nearest mile marker. If you are on the interstate it could be difficult for the towing company to find you. You want to give them the best possible location so they can get there as soon as possible. I just got a car, and I want to get a towing company so that I can be prepared in the case of an emergency. Getting to a safe location with your car is a smart idea so that you don’t interfere with traffic. 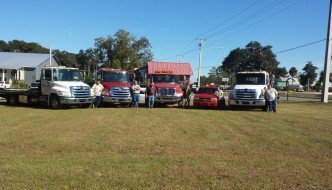 Something else to do is to get help from a towing service that accepts your insurance so that you don’t have to worry about the price too much. These suggestions are really awesome, especially the one that talks about pulling off to the side of the road if your car breaks down. I don’t think there is anything more important than staying safe during car troubles. I am definitely going to remember these if I’m ever in this situation again. My car is getting old, and I wouldn’t be surprised if one of these days it breaks down. These tips are great to know. It’s definitely important to try and find a safe location and to be able to identify and describe that location to others. I will be sure to keep these tips in mind! Thanks for sharing! Great tips to share. Thank you for all the resourceful information provided. I liked the suggestion to make sure you’re vehicle is in a safe location off the highway. I’ve read elsewhere that it can be dangerous to both you and your car if it isn’t pulled off to safe area until a tow truck comes to get it. I think if more people properly understood how to stay safe during the towing process, things would be better for everyone. I agree that it is a good idea to have towing services that you trust before an emergency hits. It makes sense that taking the time to do this before hand can help you stay calm and know that trusted help is on the way. I would want to make sure I take my time and find someone that inspires trust and who knows how to help you stay calm and provide friendly advice on your situation. Your advice to find a mile-marker or preparing your last known location and looking around for some kind of distinctive landmark is a great idea. If you know where you are you’d be able to ensure the towing service is able to find you. When you know you’ll be driving through an unknown location you’d probably want to figure out which towns are closest and if they have a towing service so that you’ll be prepared for an emergency. My brother recently had a break down on the highway. Luckily, he was able to get off the busy road. I didn’t realize how important it is to look at mile markers to make sure a towing service is able to find you. I’ll remember this if I should ever be in this situation.